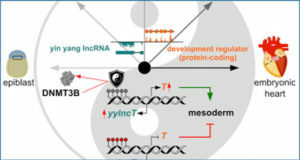 Long non-coding RNA (lncRNA) expression has been implicated in a range of molecular mechanisms that are central in cancer. However, lncRNA expression has not yet been comprehensively characterized in acute myeloid leukemia (AML). Here, researchers from the Karolinska Institutet assess to what extent lncRNA expression is prognostic of AML patient overall survival (OS) and determine if there are indications of lncRNA-based molecular subtypes of AML. The researchers performed RNA sequencing of 274 intensively treated AML patients in a Swedish cohort and quantified lncRNA expression. 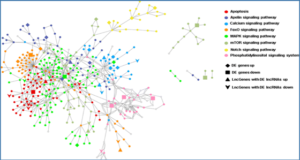 Univariate and multivariate time-to-event analysis was applied to determine association between individual lncRNAs with OS. Unsupervised statistical learning was applied to ascertain if lncRNA-based molecular subtypes exist and are prognostic. 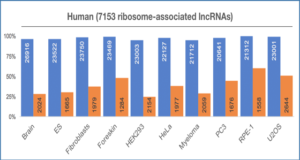 Thirty-three individual lncRNAs were found to be associated with OS (adjusted p value < 0.05). 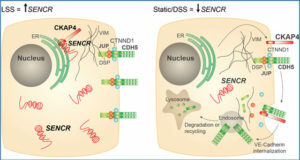 The researchers established four distinct molecular subtypes based on lncRNA expression using a consensus clustering approach. LncRNA-based subtypes were found to stratify patients into groups with prognostic information (p value < 0.05). Subsequently, lncRNA expression-based subtypes were validated in an independent patient cohort (TCGA-AML). 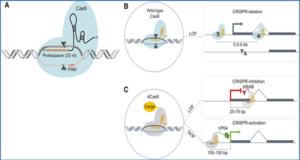 LncRNA subtypes could not be directly explained by any of the recurrent cytogenetic or mutational aberrations, although associations with some of the established genetic and clinical factors were found, including mutations in NPM1, TP53, and FLT3. Consensus clustering matrix for 4 groups. Comparing different number of clusters indicates K = 4 is the optimal number of clusters in lncRNA expression dataset. 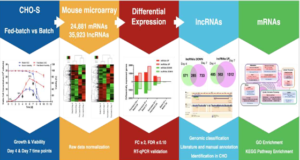 LncRNA expression-based four subtypes, discovered in this study, are reproducible and can effectively stratify AML patients. LncRNA expression profiling can provide valuable information for improved risk stratification of AML patients. Our study is one of the largest study till date, which assess the prognostic impact of lncRNA in AML patient and also provides validation of our finding in independent AML patient cohort.